Our "jaunt" on the morning of Sunday the 23rd was really awesome! Nine of us hired a hot-air balloon ride operator for a cruise over the Tuscany countryside. They even provided lunch with champagne after the trip. Pix and contact information from that and maybe even an .avi movie clip will be available sometime next week. Tip: If you do this type of ride anywhere, wear a hat! Close 2nd - Pompei. History at its finest! Venice, no doubt. Enough crust to satisfy us yankees and the tastiest pepperoni. However, Italians think we're crazy if we want to share a pizza or order more than 1 item on it. They just seem to go for the least complicated food but make it very tasty in the process. In most of the ristorantes we ate at, the food was very tasty. Tuti Ristorante in Florence serves excellent "Wild Boar in Florentine Style," a direct quote of the name of the item on the menu. Beware, however, that most will include a "cover charge," which equates, I think, to an automatic gratuity seen here in the States for groups. Your purchase usually costs you more if you want to sit down to eat what you bought in what equates here as Deli's, so if you can find a place nearby to sit, save the bucks. "Take away" signs are usually prevalent at the deli-type places. Unless you ask for some other type of wine, you will get a room-temperature dry red wine at the ristorantes. I asked for white wine, but had to change it to "bianco" while holding up the bottle. Then the waiter understood me and said, "Ah, si." The white wines are cold, as is the beer! Try the tasty Peroni beer, said to be the "National Beer of Italy." The Harp brand is good too, but I don't know where it is made. The Hotel Sonya in Rome, because they gave us key cards for the rooms. The others gave us only one metal key which had to be left at the desk when leaving the hotel. This wasn't usually much a hassle, but it seems that key cards are a much better way to go. The Sonya also has a cool "lift," their word for an elevator. Go for a 4-star hotel if you can afford it. 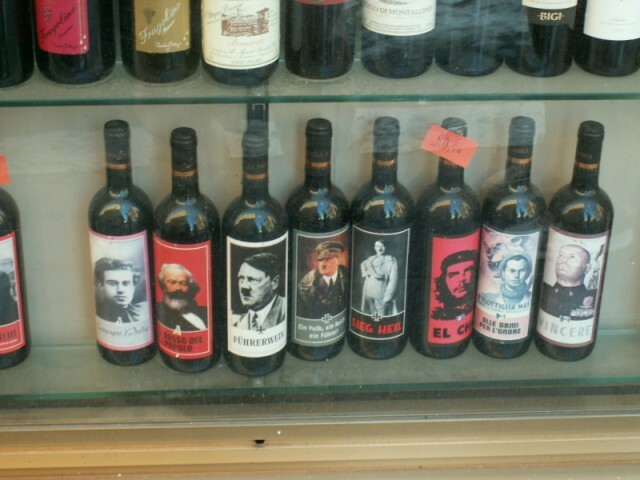 A glass & metal-framed display case outside the liquor store a few steps from the Sonya had 3 bottles of wine on the bottom shelf with images of Adolf Hitler on the labels. Have you ever seen "Fuhrerwein?" How strange! If you don't believe me, click here.